Smoothies are delicious, I wish we had an Orange Julius nearby! Instead, how about you enjoy one for me? On June 19Th, 'O.J.' 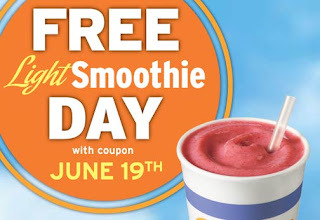 is giving away FREE 20oz light smoothies with the printed coupon. Limit 1 coupon per customer. Please copy and paste link into your browser if clicking on it doesn't work, I'm having hyperlink issues at the moment.